1978: he makes his first appearance on stage at the Kabukiza, receiving the name of Matsumoto Kintarô III. October 1981: great name-taking ceremony at the Kabukiza for 3 generations of actors belonging to the Kôraiya guild (Kôraiya Sandai Shûmei); Matsumoto Kôshirô VIII retires under the name of Matsumoto Hakuô, Ichikawa Somegorô VI and Matsumoto Kintarô III respectively take the names of Matsumoto Kôshirô IX and Ichikawa Somegorô VII. the new Somegorô plays the roles of Fukuyama and Rikiya in the dramas "Sukeroku Yukari no Edo Zakura" and "Gion Ichiriki Jaya". November 1987: Somegorô plays Hamlet. 1993: Somegorô plays Amadeus in the eponymous drama; the role of Salieri is played by his father Matsumoto Kôshirô IX. May~June 1994: first edition of the Cocoon Kabuki, which is staged at the Shibuya Bunkamura Theatre Cocoon and recreates the atmosphere of the Edo koshibai and brings the actors closer to the audience. The play "Tôkaidô Yotsuya Kaidan" is coproduced by Nakamura Kankurô V and the playwright Kushida Kazuyoshi; Somegorô plays the role of Naosuke Gonbê [more details]. August 1996: revival at the Kabukiza of Hôjô Hideji's drama "Korikori Banashi"; Somegorô plays the role of Mataichi [more details]. August~September 1996: second edition of the Cocoon Kabuki with the production of "Natsu Matsuri Naniwa Kagami"; Somegorô plays the role of Tamashima Isonojô [more details]. 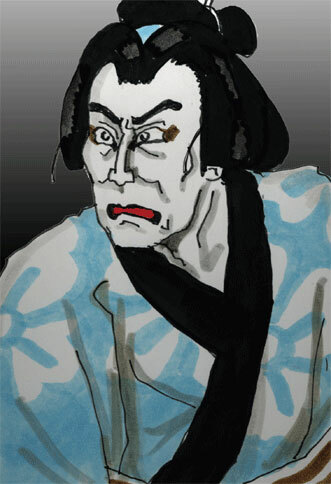 September 1999: revival at the Minamiza of Katsu Genzô III's drama "Ogasawara Sôdô"; Somegorô plays the roles of Inugami Hyôbu and Koheiji [casting]. April 2005: release of Takita Yôjirô's movie "Ashura-jô no Hitomi", in which Somegorô plays the role of Wakuraba Izumo. October 2005: release of Kurotsuchi Mitsuo's movie "Semishigure", in which Somegorô plays the role of Maki Bunshirô. November 2008: for the very first time in Kabuki history, a novel of Edogawa Rampo is adapted for Kabuki. This play, which is staged at the National Theatre, is based on "The Were-Panther" ("Ningenhyô" in japanese), a novel with the detective Akechi Kogorô, which was published in 1934; Somegorô plays the roles of Onda Rangaku and Kamiya Yoshinosuke [more details]. June 2009: Somegorô plays at the Kabukiza the role of a shishi cub in the dance-drama "Kadonde Iô Kotobuki Renjishi", which celebrates the debut on stage (hatsubutai) of his son Matsumoto Kintarô IV. February 2014: revival at the Kabukiza of Tsuruya Nanboku IV's drama "Kokoro no Nazo Toketa Iroito"; Somegorô plays the roles of Omatsuri Sashichi and Hantoki Kurobê [more details]. May 2014: Somegorô plays for the first time the 10 roles of "Date no Jûyaku", in Tôkyô at the Meijiza [more details]; he also performs in "Tsuri Onna" and the rarely-staged drama "Rosei no Yume". These roles were the privilege of the star Ichikawa Ennosuke III, who revived them for the first time in April 1979 and performed them in 9 productions from 1979 to 1999. In the 2010s, it was staged 3 times with Ichikawa Ebizô in the 10 roles, in January 2010 and August 2012 at the Shinbashi Enbujô, and in May 2013 at the Minamiza [Somegorô's interview]. November 2014: the Annual Festive Face-Showing Grand Kabuki at the Kabukiza commemorates the 32nd anniversary (33rd memorial service) of the passing away of Matsumoto Hakuô I. His two sons, Matsumoto Kôshirô and Living National Treasure Nakamura Kichiemon, are the zagashira; Somegorô plays for the first time the prestigious role of Musashibô Benkei in the dance-drama "Kanjinchô" [more details]. January 2018: great name-taking ceremony at the Kabukiza for 3 generations of actors belonging to the Kôraiya guild (Kôraiya Sandai Shûmei); Matsumoto Kôshirô IX, his son Ichikawa Somegorô VII and his grandson Matsumoto Kintarô IV took the names of Matsumoto Hakuô II, Matsumoto Kôshirô X and Ichikawa Somegorô VIII at the Kabukiza; the new Kôshirô played the roles of Matsuômaru and Musashibô Benkei in "Kurumabiki" and "Kanjinchô" [more details]. February 2018: second month of shûmei at the Kabukiza for Matsumoto Hakuô II, Matsumoto Kôshirô X and Ichikawa Somegorô VIII; the new Kôshirô played the roles of Ichijô Ôkura Naganari and Kumagai Jirô Naozane in "Ichijô Ôkura Monogatari" and "Kumagai Jin'ya" [more details]. April 2018: Matsumoto Hakuô II and Matsumoto Kôshirô X celebrated their shûmei in Nagoya at the newly-built Misonoza (kokera otoshi); the new Kôshirô played the roles of Sano Jirôzaemon, Togachi Saemon and Fujiya Izaemon in "Kagotsurube", "Kanjinchô" and "Yoshidaya" [more details]. Matsumoto Kôshirô X is a talented tachiyaku/nimaime actor of the Kôraiya guild.